IN celebration of Scotland’s Year of Young People 2018, Muckmedden Events, the fun-loving mountain bike event organisers from Perth & Kinross, have scheduled a number of exciting opportunities to get local young people between eight and 26 involved at Cream o’ the Croft Mountain Bike Festival (Crieff, Perthshire – 15 – 17 June) and The Eliminator Mountain Bike Festival (Newburgh, Fife – 31 August- 02 September). The organising teams at both events are looking to recruit budding designers, engineers, musicians, singers, DJ’s and entrepreneurs to showcase their talents at both family-friendly festivals that include live music, gourmet food and drink and loads of activities and entertainment for all ages on and off the bike. With the inaugural Monster Balance Bike Challenge, teams from local community groups are being invited to design, build and race crazy balance bikes made from recycled materials at both festivals. To boost the appeal of their event villages, Muckmedden are also looking for young entrepreneurs who have made, designed or invented a new and exciting product or service (not food or drink) and who are eager to test the market with a free retail pitch, selling alongside more established independent professional traders. Young singers, musicians, bands, DJ’s and other performers are also being invited to fill various slots on the live stage at The Eliminator at the end of August, showcasing their talents to more than 1,500 people over the event weekend. The Monster Balance Bike Challenge competition that will be staged at both summer festivals; a collaboration between Muckmedden Events, Bike Station (Perth), Angus Cycle Hub, Recyke-A-Bike and Coupar Angus Cycling Hub, gives young members of local community groups the chance to design and build a Monster Balance Bike under the expert guidance of their local bike recycling centres. 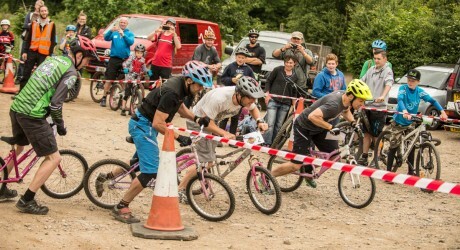 They will then compete against other teams of all ages at Cream o’ the Croft Mountain Bike Festival in Perthshire in June and The Eliminator Mountain Bike Festival, being staged in Fife later in the year. To level the playing field, the challenge is not just about getting a fast race time. Teams will also be scored on their ingenuity and imagination before they’ve even turned a wheel. The crazier the design, the better! Both the Cream o’ the Croft Mountain Bike Festival and The Eliminator Mountain Bike Festival are looking for talented young entrepreneurs to apply for limited free retail pitches, alongside professional traders, in the event villages in which to sell a new product or service that they have invented, designed and made themselves. Muckmedden Events are also inviting young performers (aged eight-to-26) from Fife and Kinross to showcase their talents in front of a 1,500-strong crowd of all ages with special slots on the live performance stage across the weekend of The Eliminator festival at the end of August. Auditions are invited from performers of any genre and material that will fit in well at a family-friendly festival – from spoken word, poetry, comedy and beatbox to opera, classical, west end musical, Celtic, folk, jazz, indie and everything in between. Both festivals, supported this year through EventScotland’s National Events Programme, share key traits that include family-friendly camping and glamping, delicious locally-sourced food and drink, mountain bike racing for all ages and abilities, live music and super-fun festival activities and entertainment on and off the bike. See ‘Notes to editors’ for more information on the opportunities open to local young people between eight and 26 at both the Cream o’ the Croft The Eliminator Mountain Bike Festivals; and for application details. Please contact Paddy Cuthbert if you would like to arrange to attend either Cream o’ the Croft or The Eliminator for an event feature. The Eliminator Mountain Bike Festival will be staged at Parkhill Farm, Cupar Road, Newburgh, Fife, KY14 6HR from Friday 31 August to Sunday 02 September 2018. EventScotland is a team within VisitScotland’s Events Directorate, the national tourism organisation which markets Scotland as a tourism destination across the world gives support to the tourism industry and brings sustainable tourism growth to Scotland. For more information about VisitScotland, see www.visitscotland.org or for consumer information on Scotland as a visitor destination see www.visitscotland.com. Muckmedden Events, Bike Station (Perth), Angus Cycle Hub, Recyke-A-Bike and Coupar Angus Cycling Hub are recruiting young and upcoming designers, engineers and racers to form a Race Team capable of designing, building and racing a ‘Monster Balance Bike’ to compete at this year’s Cream o’ the Croft and/or The Eliminator Mountain Bike festivals! Teams of three people maximum (1x Mechanic and 2x Racers) should have a mix of engineering skill, resourcefulness and race craft. But most importantly of all…. a sense of humour! What is a ‘Monster Balance Bike’? – A Monster Balance Bike is a two-wheeled bike without pedals, which has been built using only second-hand bike parts. Bikes must be designed and built by each team and then raced at Cream o’ the Croft and The Eliminator Mountain Bike Festival. Accessorising (Max ten points) – Using additional accessories such as handlebar tassels, horns, wing mirrors, fairings etc. Some accessories may be removed for racing, but you’ll still get the points. Weirdness (Max ten points) – Combining different wheel sizes, using crazily shaped handlebars, big wheels on teeny-weeny bike frames…. the wilder your bike, the more points you’ll rack up for the team! Overall Quality of Team (Max ten points) – You look like a Moto GP Race Team using only second-hand bike parts? You deserve points for that! Ingenuity (Max ten points) – You made your frame from scratch using old scaffolding poles? Here, have some extra points! After scrutineering on the day of the race, each team will compete in a series of fun-focused ‘Eliminator’-style relay races on a simple, oval track. Points will be allocated according to your team’s final position in each race. The overall points tally of each Team after each race determines which who progresses in the tournament. All parts used in the build must be second-hand. The total sum of parts on each bike – including the frame – must be worth no more than £50 (as valued by the Judges). Bikes must have a seat. Bikes must not have pedals and must be powered by the rider’s feet on the ground. Bikes must have two wheels with a combined maximum diameter (i.e. the size of both wheels added together) of no more than 46” in total. Front and rear wheels can be different sizes. Please note: Bikes will be scrutineered by the judges on race day. In the instance of any suspected ‘twisting’ of the rules (i.e. someone has removed the pedals from a £7k Carbon Downhill bike and says it cost £40) teams may be asked to swap bikes with another team. We doubt we’ll have to do this, but just to warn you this could happen, so please stick to the rules to keep it fun for everyone! Riders must stay seated for the duration of the race (or face a points deduction). No intentional barging or holding back an opponent. Have you made, designed, or invented something? Do you have an idea or a special way to make a product? Want to try and sell it? Muckmedden Events is inviting Young People aged between eight and 26 to compete for a Young Entrepreneur’s Stall at either, or both, of its festivals this year: Cream O’ the Croft from Friday 15th June to Saturday 17th June, 2018 at Comrie Croft, Braincroft, Crieff PH7 4JZ and The Eliminator Mountain Bike Festival from Friday August 31st to Sunday September 2nd 2018 at Parkhill Farm, Abbey Road, Newburgh, Fife KY14 6HH. Entrants should send us their names, their business name, tell us about their product**, explain how they made their product, and design a poster and sign to advertise their business at the event. The competition is open to all young people from ages eight-to-26. Ten lucky winners will be given a FREE pitch (a table in a marquee) in our event village to sell their products, alongside the other professional traders. The only rule is that you must make/source your product and sell it yourselves! This a is great opportunity for young Scottish folk to explore their entrepreneurial talents. * Children under the age of 18 must be accompanied by an adult during the festival. ** No food or drink, please. Send the above information to Rachel at info@muckmedden.co.uk. Cream o’ The Croft applications must be received by Friday 1st June 2018. Eliminator applications must be received by Wednesday 1st August 2018. Attention all young singers, musicians and bands! Muckmedden Events Ltd. is inviting Young People aged between eight and 26 to audition for the chance to perform their music live on the stage at the Eliminator Mountain Bike Festival taking place from Friday 31st August to Sunday 2nd September 2018 at Parkhill Farm, Abbey Road, Newburgh, Fife KY14 6HH. We are looking for any musical style that will fit in well at a family-friendly mountain bike festival, which is expecting to attract around 1,500 people over the weekend. Soloists, duos or trios – preferably acoustic – are encouraged to audition for the opportunity to musically entertain the festival’s visitors, both male and female, who will range in age from babies to the elderly, with the average age of attendee being around 31 years-old. We encourage any style of performance from spoken word, poetry, comedy and beatbox to opera, classical, west end musical, Celtic, folk, jazz, indie and everything in between – you do it – we’ll listen, and if we think it’ll fit into our festival schedule, you’ll be offered a gig! Check out the Muckmedden website to see what the festival is all about…. it’s a lot more than mountain biking. There will be a small stage (approx. 3m x 2m) with a sound system located inside our star shade marquees. Depending on the weather you will perform to either a small crowd inside the marquee or to a larger audience outside in the event village. Various performance slots will be available over the course of the weekend starting on the Friday from 3pm and finishing at around 5pm on Sunday afternoon. We’ll sort out the line-up and timings after the auditions. Send an email with a link to your YouTube/Vimeo (or other online platforms) audition clip to Rachel at info@muckmedden.co.uk, accompanied by a bio about the band including your names, ages, and where you are from. * Please note that children under the age of 18 must be accompanied by an adult during the festival. Audition pack must be received by Wednesday 1st August 2018. Check out too twitter.com/allOutdoorsPR, twitter.com/allFestivalsPR and twitter.com/allMusicPR.